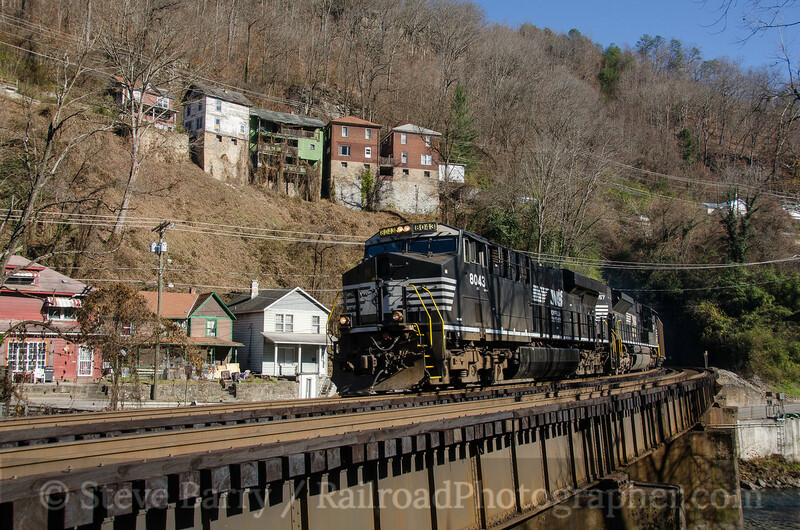 On the way back from photographing the Clinchfield Santa Train, I headed into the coal fields of West Virginia, specifically the Pocahontas District of Norfolk Southern. McDowell County, West Virginia, is one of the most economically depressed areas in the United States as the world moves away from using Appalachian coal. There wasn't much traffic on the former Norfolk & Western, and of the few trains that ran a lot were not coal trains. We did see a coal train heading east through the town of Keystone (above), but the coal mine just west of town was silent. 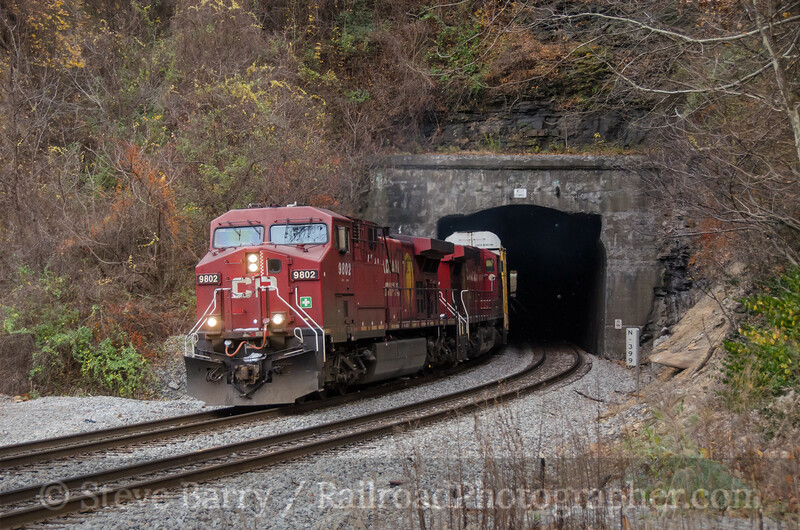 A pair of Canadian Pacific diesels led another eastbound train out of the tunnel at Welch, but they were pulling auto racks. After dark a three-unit helper set headed west, looking to tie onto an eastbound coal train at Farm (west of Welch). The west-facing unit was Norfolk Southern's "Nickel Plate Road" heritage unit, one of 20 such units painted to honor the predecessor railroads of NS. We saw the special diesel exiting the tunnel at Big Four between Kimball and Welch. Another of the heritage units was in the helper pool, as well. 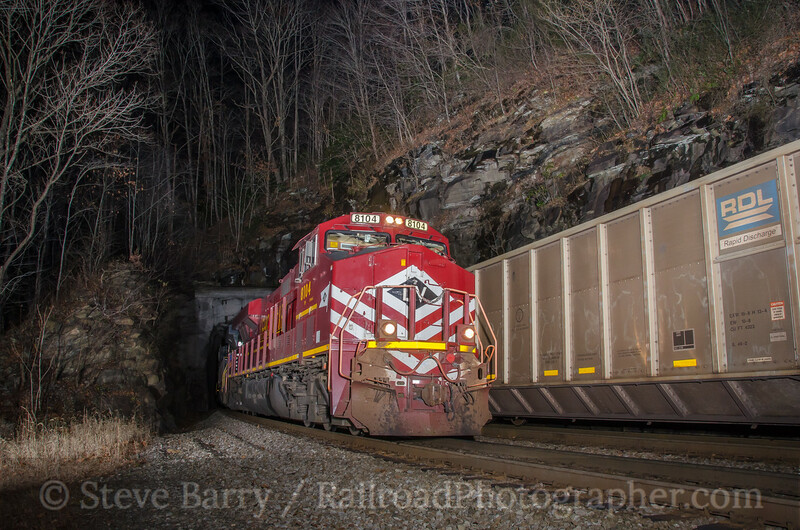 The Lehigh Valley heritage unit led a two-unit set of helpers west at Big Four, meeting an eastbound coal train at the tunnel. 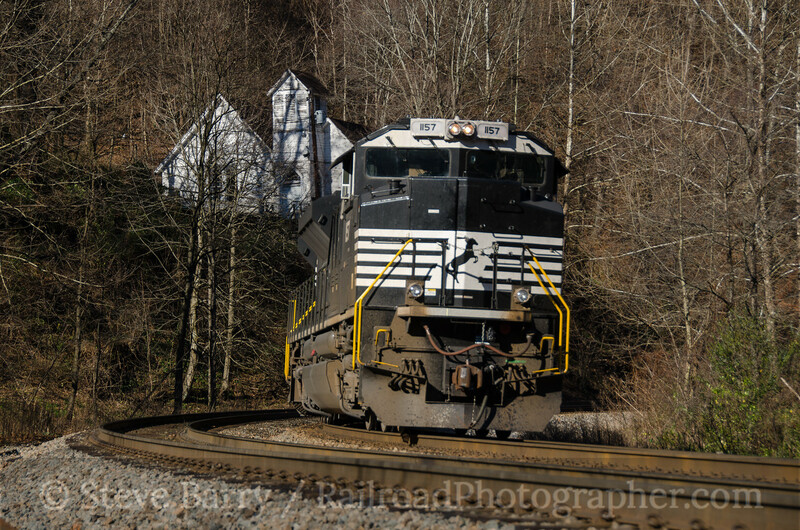 Despite the loss of coal traffic, the Pocahontas District still sees a few trains. 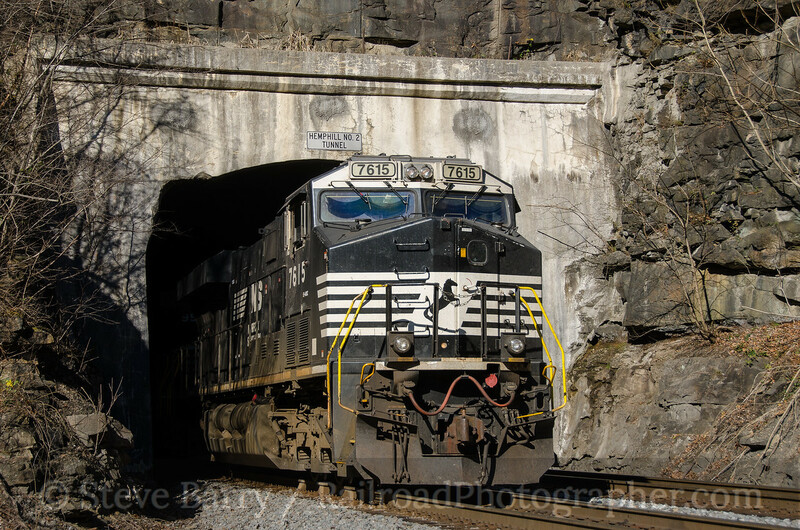 The line had its tunnels enlarged a few years ago to allow for the passage of double-stack container trains, as the route does provide a direct line from the midwest to the ports of Virginia. A double-stack train was heading west as it passed under the signals at Eckman. Changes are coming to the railroad. 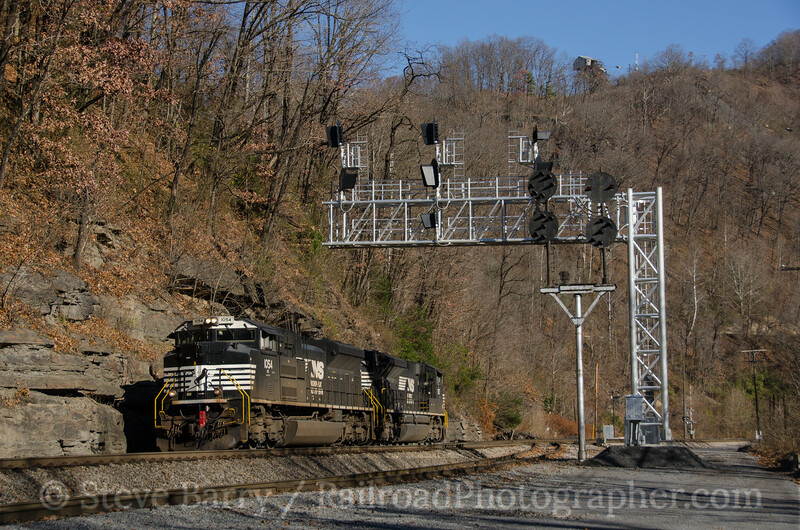 Not only are traffic patterns shifting as coal diminishes, but the railroad's signal system is being upgraded for the implementation of Positive Train Control. This means the classic color position light (CPL) signals that were a hallmark of the Norfolk & Western are being replaced. At Keystone a set of CPLs stand with their modern replacements towering over them. All around McDowell County are signs of towns that are shrinking. Schools and churches that are no longer used can be found in almost every town. 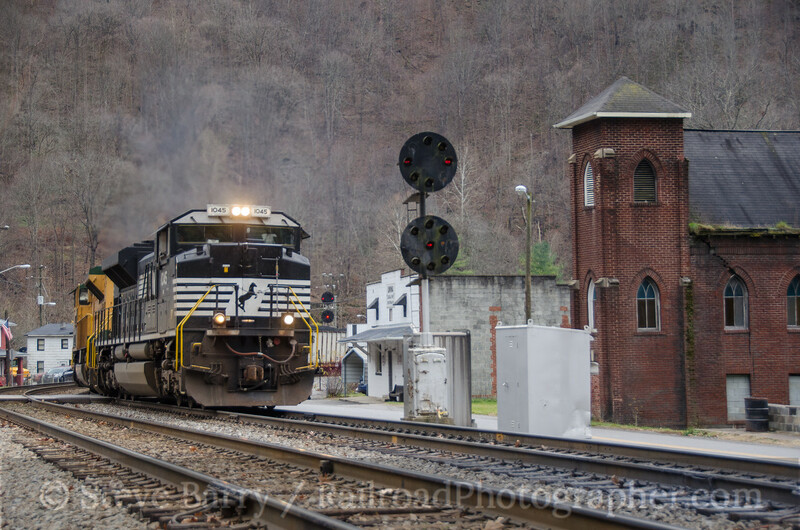 A Norfolk Southern light engine set, heading west to help a train back over the grade to Bluefield, drifted away under the church at Eckman. 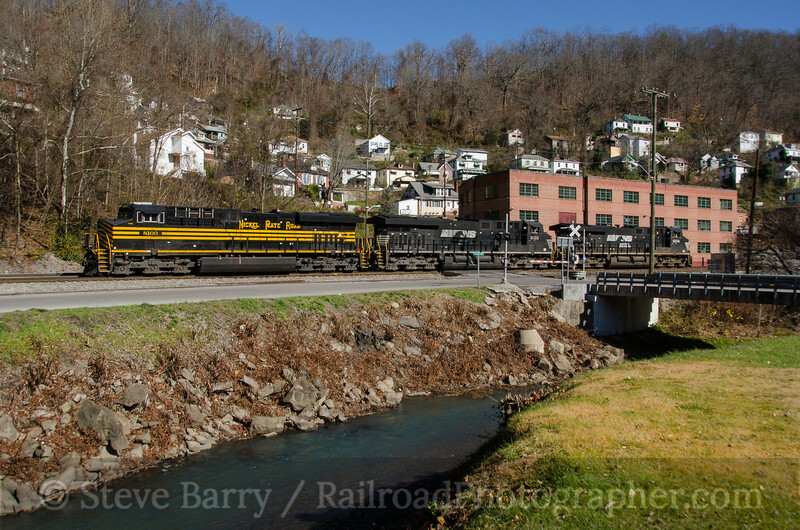 More locomotives are needed to bring trains east over the grade from Farm to Bluefield than are needed to take trains west. Thus, light engine moves are sometimes found taking locomotives back west to balance power. A westbound set passes under the abandoned school at Eckman. When the Norfolk & Western built this piece of railroad, they didn't mess around. There aren't any large bridges on the line, as the railroad generally stayed in the bottom of the valleys and followed the river (the Tug Fork in particular). But when the river made a horseshoe bend around a mountain, the railroad simply dug through the mountain and met the river again on the other side. Thus, tunnels are numerous. A westbound helper set was heading into Hemphill Tunnel No. 2 west of Welch; at Hemphill the railroad goes through a tunnel, pops out briefly to cross the river on a low bridge, and pops back into another tunnel immediately. 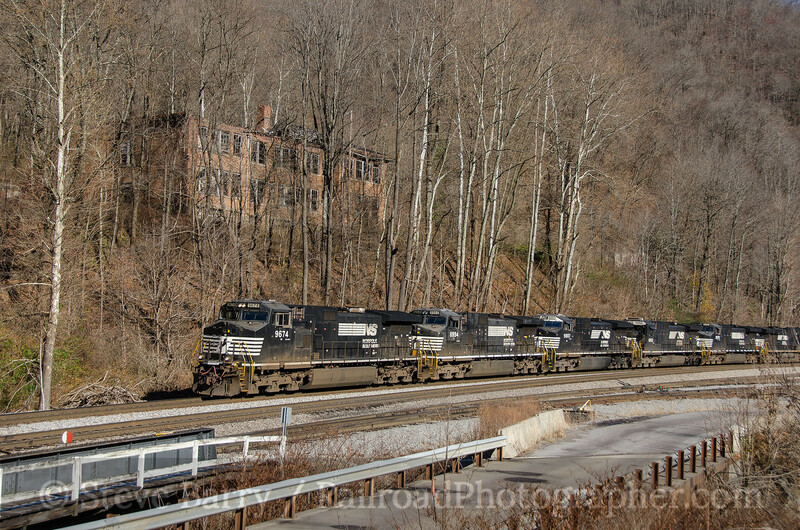 We weren't seeing many trains, especially loaded coal trains, so when a westbound helper set left Bluefield and passed through Welch it got our hopes up. Alas, an eastbound train never showed up for the units to push back east. The Nickel Plate Road heritage unit did the honors of leading the helper set west. 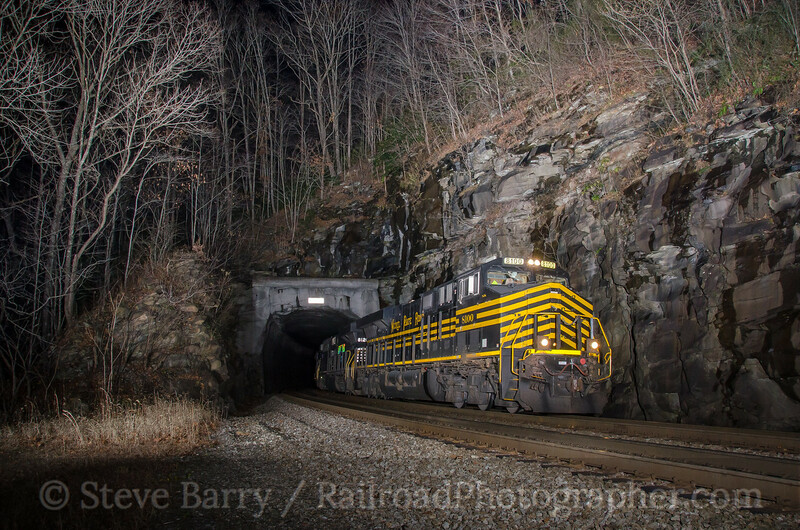 Late in the afternoon of our second day on the "Pokey" we finally saw a westbound empty coal train emerging from the tunnel at Welch. The tracks exit the tunnel and immediately cross the Tug Fork. With the day winding down and the shadows in the mountains growing deep, it was time to head east. The sun was still peeking over the hills at Bluefield, where the Lehigh Valley heritage unit sat waiting for a helper call that did not come on this day. 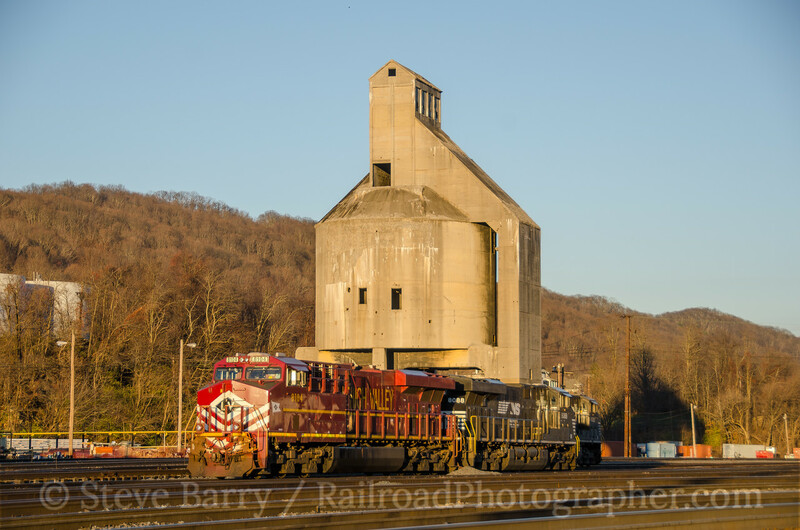 The large coaling tower is from the days when Norfolk & Western steam dominated the mountains. Now, it sits silent. Sadly, all of Bluefield and the Pocahontas District is silent for long stretches at a time, as coal only trickles out of the region. Photos from this post can be purchased here.